Chapter 3: The Butlerian jihad. 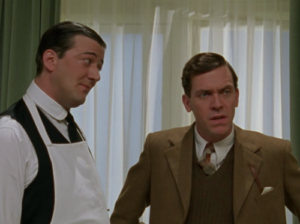 I am a fan of Wodehouse, and there’s a lightness of touch and delight in service in his work that has informed much of the way I’ve dealt with the popularly disliked chores of day-to-day existence. The inevitability of sinks full of dishes and our ultimate and possibly final death are on a similar par, and there’s something in accepting this as part of the fabric of the world and developing a comfort with all that I’ve since found incorporated in many of the best works of eastern philosophy. We all serve something, whether it is our worst instincts or the missions of our clumsily attempted states of transcendence. There’s something about the butler’s calm, though. 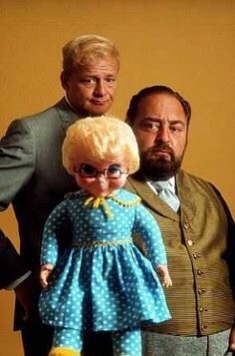 Even as a child, I was oddly fascinated by the composure of Mr. French on the long-forgotten TV series Family Affair, who seemed perpetually irritated by his young charges, even as he dealt with them with love and patience even as they committed crimes against domestic order. Back then, I had no idea that I was watching with an eye towards understanding, or that a blunt-force trope of literary and cinematic storytelling would eventually be a useful posture of self-understanding in the way that the poses of yoga serve as somatic markers for emotional and intellectual states, but we seldom know where we’re going until we’re there. Thing is, when you’re an off-the-beaten-path kind of kid trying to make your way in a school system designed to be a factory for willing labor, you develop modes of interacting that suit the situations around you, and for me, a little formality was always a nice language of deportment when maintaining social connections with those who didn’t always understand your ways, and I was always fascinated by how Mr. French would interact with the kids with a sort of combination of exasperated indignance and kindhearted indulgence. It seemed…familiar, somehow, and there’s a reason for that. In a world of parents and adults who babytalked their children through their toddler years, dumbing language down to an imaginary appropriate level of primary colored false youth, I was surrounded by adults who didn’t change their tune or tone to reach to my presumed low station in conversation, but rather offered up the possibility that, yes, some words and concepts would confuse me, but that the answer to that was not to erase the contours and complexity of things to ease my uncertainty, but rather to answer all questions as directly and concisely as possible. From my father, I learned the luxury of metaphor, of rich Southern similes oozing with layers, and from my mother, I learned the joy of dignity in presentation, as well as accuracy in terminology. Older women would ask me complicated questions, and listen with the patience of saints, while our next door neighbor, Mr. Joe, would sit with me in the basement workshop and explain detailed processes in radio electronics with great forbearance, knowing that only a trickle of ideas would make it through to my brain and the rest would need to be repeated, often in appallingly close succession. The best of all was the one teacher I had in the entirety of my years in early schooling who had a perfect, glorious patrician way of being in the world that was cast in sharp relief by her easy laugh and occasional exclamation, in the face of surprise, delight, or utter frustration, of “Good Godfrey!” which stood as one of those minced oaths that fell easily to hand with a respectable Catholic lady of her years and was somehow both free and formal at once. In her presence, I felt safe and celebrated, and the lesson set in, deep in my bones. My tendency towards formality as a diplomatic tool was a problem in school, where the slouchiest attitudes of eye-rolling dismissive imperious cooler-than-thou were shifting into cultural dominance, and my complaint that the boys surrounding my seat on the bus were bothering me with their filthy humor was noted by our bus driver with a long sigh. The bus driver looked back at me as I stood there, the other kids having left the bus. “I’m gonna start calling you ‘Vulgar and Vile,’ with as much as you complain about that,” he said, and shooed me off the bus. In time, my inner butler would give up, and I became more or less as vulgar and vile as my classmates when I discovered the dirty joys of trashy jokes, cretinous allusions, and sworn invective, though my interior Jeeves just disappeared into his room to wait out the horrors of high school, reemerging decades later when my first niece was born. From the first day I was offered the chance to awkwardly hold the fragile, bubbling, odd-smelling parcel that a baby was to me, I knew both that I was not naturally given to such things and that the formal distancing of a faithful family retainer was the most brilliant possible way to interact with children. When my niece, and then, along the way, my later niece, were in my company, I’d deal with my anxiety about their limited communication skills by speaking to them with the tone and timbre of a long-suffering Reginald Jeeves in service to an out-of-control specimen of the entitled classes, as children tend to behave, embracing the importance of service and a continuing education in how to interact with the future of the species with as much grace and patience as I’d have in my twenties, but it was a chore that became easier as time progressed. I aimed to be as patient and useful as Jeeves, as amusingly gruff and adoring as Mr. French, even as I hoped that I would, in my way, offer to the girls some of what I imagined was my inner Auntie Mame—the embrace of joy and the evangelical zeal to give the next generation access to the best things I’d had within my grasp in my own tender years. When my father died, with one niece four and the other just arrived, and with my brother living in the midwest, I felt a responsibility to be something of a standard bearer of the male side of the family, even though I was still mired in the mistaken belief that I really didn’t care much for children. Like all the best of the grown-ups I remember from long ago, it’s become entirely natural to engage Little Miss with a mixture of play and vocabulary instruction well beyond her age, because children deserve nothing less than to be considered fully human. A petite head tilts, accompanied by the semiotics of “huh?” It is a similar display to when Little Miss’s new friend pointed to The Troubadour and asked, innocently, if that was Daddy, did that mean was I her grandfather, but I am nothing if not a master of restraint. A small eyebrow lifted gently in a way that made me happy for all mankind. No part of a thing goes entirely without notice. The tilt returns, then levels out. Eyes roll. It’s a new skill, but she shows promise. Her middle school years are going to be terrifying. “Entour-whaaa?” she starts to say, but takes off instead to join a scooter gang. Every day is renewed, and renewing.